Count me on the bandwagon of critics who have been pleasantly surprised and entertained by this latest Pixar creation, which will compete along with Finding Nemo and Toy Story as one of the great Pixar films and new-era Disney classics. Unlike other films aimed to exploit the summer kid market at the expense of adults, Up is a thoroughly sophisticated film, a story as layered as the best literature, that also speaks to children in a way that keeps them entertained throughout. The genius of this film lies in the 20-minute prologue, which encapsulates the life of old-man Carl Fredericksen beginning when he is a little boy, enthralled with the adventures of the lost-world traveling Charles Muntz (voiced with marvelous obsessional zeal by Christopher Plummer). The young Carl meets an equally enraptured young girl - Ellie - who ends up becoming his wife. Carl and Ellie vow to travel to South America together, to have their great adventure. But life has a way of getting in the way, and by the time Carl and Ellie are ready to leave on their trip to South America, it is too late - for Ellie, at least. The introduction with Carl's back story is surprisingly moving - It's a Wonderful Life done with a gently animated montage - but also, extremely smart. By introducing Carl as a boy with a shared dream, both the children and the adults in the audience are more fully able to relate to the 78-year-old Carl, whose dream is no more complicated than to fulfill a child's desire, and a promise he made to the love of his life. While others might interpret the aloof Carl to be a self-obsessed shut-in, we're able to understand the powerful sentimentality - and sadness - that drives him on his quest. 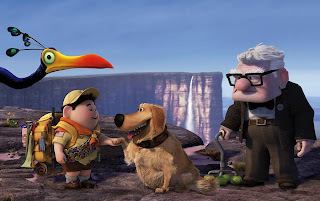 Interestingly, while grief has closed Carl up, everyone he meets on his journey is unabashedly open - from the obsequious eight-year-old explorer Russell, who is inadvertently swept along with Carl on his journey of self-exploration, to the wonderfully zany creatures they encounter along the way, including a talking dog and a kind of big blue ostrich. All they want to do is love the grumpy, single-minded Carl, but they all find that friendship is not quite as simple as it seems. As with the best children's stories, then, Carl's journey is about finding a passage out of grief and back into life, or the next stage of his life, anyway. Thus Up is the direction that Carl must go, and as Freud so insightfully pointed out, his house is the symbol that he must take with him (Freud, if you missed that class in college, postulated that a house, in dreams, represents our own ego - or more literally, our own body). Thus it is in this story that Carl literally ties an immense bouquet of balloons to his chimney in order to float his house from the city that's grown up around him to the wilds of South America. Through a wonderfully handled use of metonymy, Carl's house also acquires the name Ellie - it literally becomes the memory of his wife, which he must drag with him until the dream and balloons deflate, and the house finally empties itself. Of course, all this symbolism means nothing to the kids in the audience, who simply find the talking dogs hilarious and the menacing Muntz an efficacious villain. They also justifiably sympathize with the loquacious young Randall's attempts to penetrate the defenses of the equally obsessed Carl. If all this story had going for it was the sympathetic telling of an old man re-finding his joy for life, it wouldn't be such a success. Pixar blends that story with the humor and animated thrills that have become its trademark - the two old men stiffening into a freeze when their backs both go out as they are about to begin a sword fight; a wonderful pause in the big chase scene as in response to the "where'd they go" question, Randall slaps against the big window in front of Muntz and squeezes along it, while Muntz only follows with his eyes; the various looks of surprise and awe as Carl's house drifts along the buildings of his city as he makes his ascent. The Pixar team has mastered the ability to pack a lot of meaning into these brief moments of expression - they sweat the details, and the results are there on the screen. Like the most complex and revealing of dreams, Up carries us along through the wilds of the imagination, and then brings us back home with a satisfying awakening. It is the most basic of stories, told with the kind of wonder that enthralls adults and children alike.